New York Mets’ Jacob deGrom delivers a pitch during the first inning of Tuesday’s against the Miami Marlins in New York. 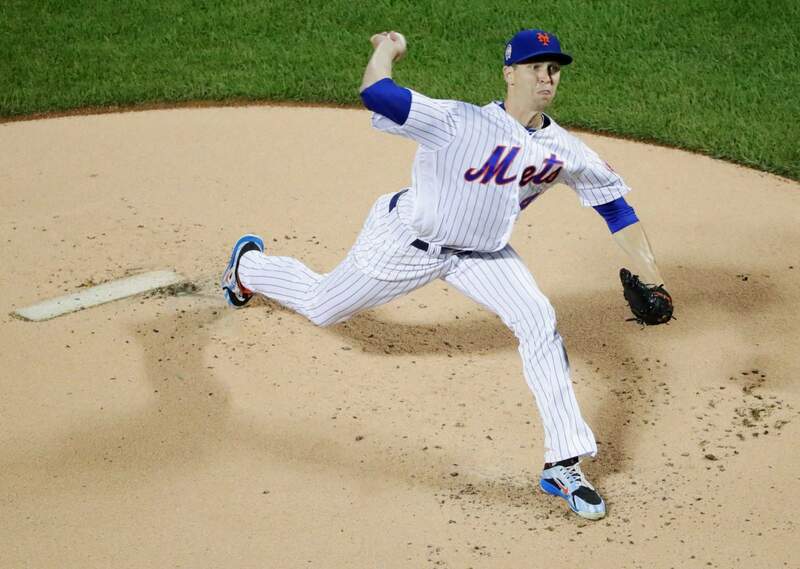 NEW YORK – Jacob deGrom, Max Scherzer and Aaron Nola are going pitch for pitch in the NL Cy Young Award race. With 2½ weeks left in the season, it’s time to ask: Should one of those three could be MVP? The NL has produced at least one hitter worth 6.0 wins above replacement (WAR) each season since the Chicago Cubs’ Hack Wilson topped 1926 at 5.7, according Fangraphs. For a catch-all stat like WAR — which measures contributions on offense, defense, baserunning and pitching — that 0.6 gap from Arenado on up is nearly negligible. Can’t go wrong choosing between them. It’s unusual, but not unheard of, for a pitcher to lead a league in WAR. By Baseball-Reference’s math, Clayton Kershaw did it when he won NL MVP in 2014, as did Justin Verlander for his AL MVP in 2011. Corey Kluber, Cliff Lee, Roy Halladay and Zack Greinke have each done it once over the past decade, too. But in the age of ever-tighter pitch counts and innings limits, it’s not as common as it once was and figures to keep getting tougher. The cases for those pitchers are a little different than their predecessors — especially for deGrom. Nola’s pitch seems to have lost a little steam as the Phillies have faded out of the NL playoff picture. Philadelphia dropped 6½ games behind Atlanta in the NL East after getting swept by the Nationals in a doubleheader Tuesday. Nola was 16-4 with a 2.29 ERA prior to a start Wednesday and wasn’t far behind Scherzer with 8.9 WAR, per Baseball-Reference.